BCSE support staff has stepped up to the plate time and time again to help support any issues we have encountered, from the most complex issues down to simple issues with free products. We highly recommend BCSE for X-Cart software modification and support. Provide your customers a list of manufacturers that's actually useful for them! 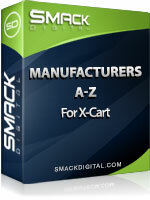 Manufacturers (A-Z) for XCart organizes your manufacturers/brands by sorting them alphabetically on separate, easily spiderable pages, one page per letter. It also allows you to feature selected manufacturers, and includes optional search engine friendly urls for the A-Z pages. Allows customers to find specific manufacturers quickly and easily. Manufacturers (A-Z) itself has a configuration for SEO friendly urls. Option to show all manufacturers or only those with assigned products. Allows you to select featured manufacturers on the main page before a letter is selected, giving these manufacturers prevelance both to users and to search engines. Allows you to easily configure featured manufacturers on listing pages. Displays featured manufacturers with logo images. Configure which letters the user can sort by. Works seamlessly with popular SEO mods such as Custom Dynamic Search Engine Friendly Links (CDSEO) for X-Cart. Display can be easily changed using CSS.